Savings that can't be beat! All products are inspected before they leave our warehouse, insuring the products are in top working condition. ASG, Division of Jergens, Inc., a leading manufacturer and distributor in assembly products and solutions, is offering steep discounts on top selling torque products from all four of ASG’s product lines – Assembly, Industrial, Precision Fastening, and Automation. Products include tape dispensers, torque testers, torque wrenches, screw presenters, bits, and both electric and pneumatic screwdrivers; including the reputable Hios® and Fiam® brands. Premium manual torque drivers, normally priced $150-300, now range from $10-$22 and torque wrenches are selling between $6.75 and $88! One can purchase a Fiam® 0.6 to 2.2 N.m Forward Pistol Pneumatic Driver for $125.25 – that's 92% off list price. Take advantage of these savings now. 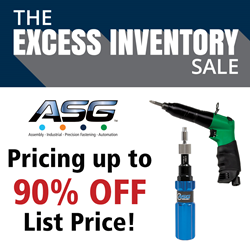 For a complete listing of ASG’s excess inventory, visit their promo page to download the file. Add ASG to your list of favorite sellers and visit often; the list is ongoing and ever-changing. It is updated on a monthly basis with different products being added and removed. ASG is ISO 9001:2008 certified and has been offering products and solutions for the assembly industry for over 35 years. A complete line of torque control products and precision fastening equipment is offered through ASG Assembly, Industrial, and Precision Fastening, and Automation product groups and includes electric and pneumatic torque control drivers, automated fastening systems, torque testers, work station accessories, precision screw presenters, automatic tape and label dispensers, the X-PAQ™ System, Integrated services, and more. For more information, visit http://www.asg-jergens.com or follow the company on Facebook, Twitter, LinkedIn and YouTube.